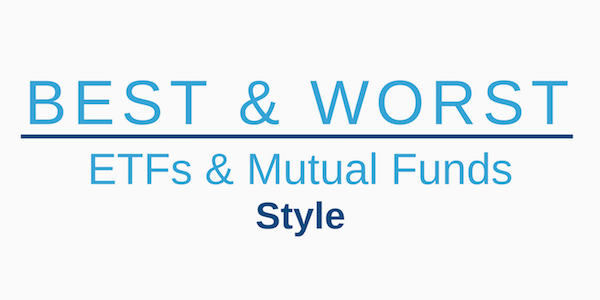 The All Cap Value style ranks fourth out of the twelve fund styles as detailed in our 1Q19 Style Ratings for ETFs and Mutual Funds report. Last quarter, the All Cap Value style ranked fourth as well. 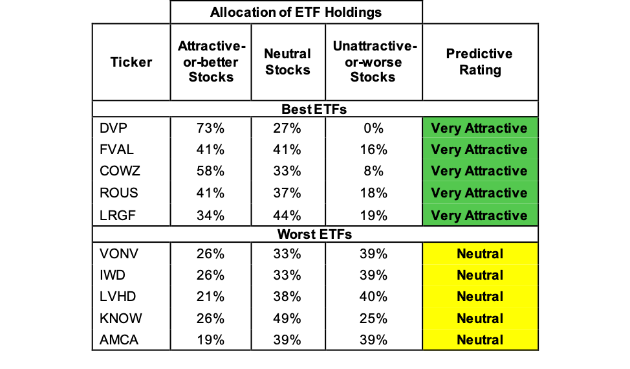 It gets our Neutral rating, which is based on an aggregation of ratings of 26 ETFs and 369 mutual funds in the All Cap Value style as of January 22, 2019. See a recap of our 4Q18 Style Ratings here. Figures 1 and 2 show the five best and worst rated ETFs and mutual funds in the style. Not all All Cap Value style ETFs and mutual funds are created the same. The number of holdings varies widely (from 18 to 1554). This variation creates drastically different investment implications and, therefore, ratings. 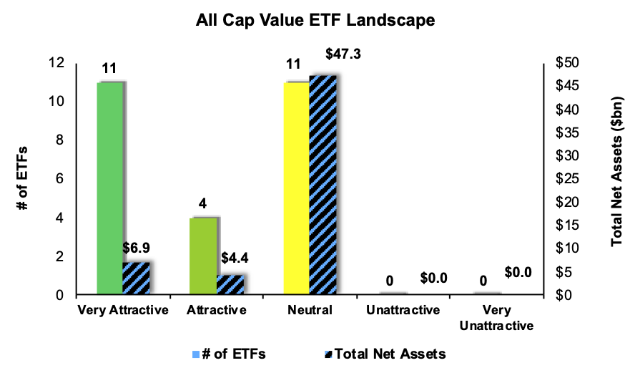 Investors seeking exposure to the All Cap Value style should buy one of the Attractive-or-better rated ETFs or mutual funds from Figures 1 and 2. Three ETFs (QVAL, GMFL, PY) are excluded from Figure 1 because their total net assets (TNA) are below $100 million and do not meet our liquidity minimums. Six mutual funds (AQVVX, AQVYX, AQVPX, LSVMX, LVAMX, VALAX) are excluded from Figure 2 because their total net assets (TNA) are below $100 million and do not meet our liquidity minimums. ETF Series Deep Value ETF (DVP) is the top-rated All Cap Value ETF and SunAmerica AIG Focused Dividend Strategy Fund (FDSWX) is the top-rated All Cap Value mutual fund. 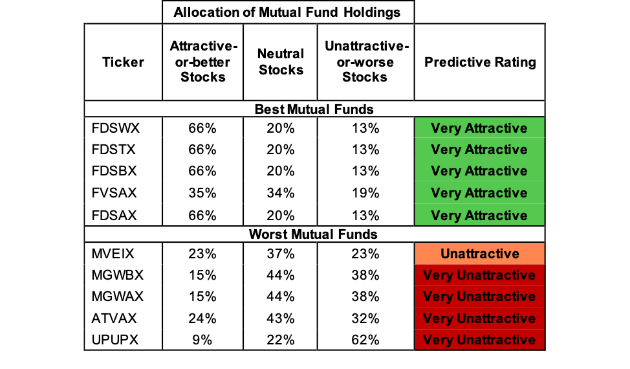 Both earn a Very Attractive rating. iShares Russell 1000 Pure U.S. Revenue ETF (AMCA) is the worst rated All Cap Value ETF and Upright Investments Upright Growth Fund (UPUPX) is the worst rated All Cap Value mutual fund. AMCA earns a Neutral rating and UPUPX earns a Very Unattractive rating. 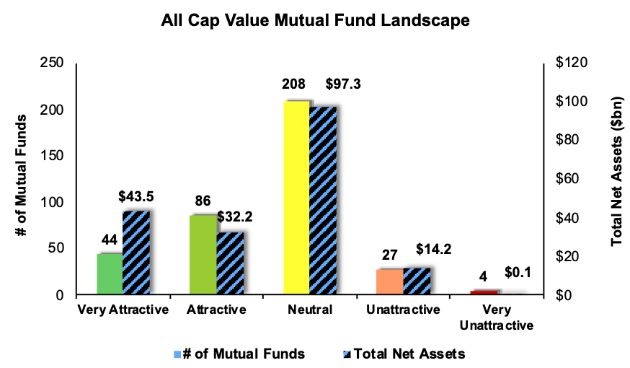 Figures 3 and 4 show the rating landscape of all All Cap Value ETFs and mutual funds. This article originally published on January 24, 2019.